Rockler makes and sells tons of great products that make building stuff a whole lot easier, and the task they want to make easier this time, is building custom window shutters. Their new shutter jig solves the problem of positioning and spacing the shutters correctly, but Rockler also has an online plan wizard so that you can make sure each shutter fits onto each window. 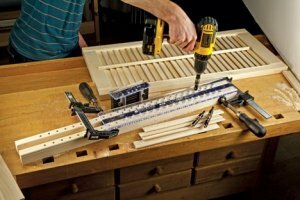 Costing about $120 for each jig, Rockler is offering jigs for each of the most common louver sizes, and an option to choose a fixed or movable louver style. Along with the jigs, Rockler is also selling all the materials needed to build a complete window shutter; so you can use the online design wizard to calculate your material cost before you even get started. The louvers do not look too difficult to build, but you will need a few shop tools.